Cylinders are to ceramics what the alphabet is to writing, and the first thing all potters have to learn is to throw a cylinder. This sounds much, much easier than it is. I’ve been at potters’ wheels in various places for years but am still a wobbly, faltering potter wonderstruck if I manage to pull something off. 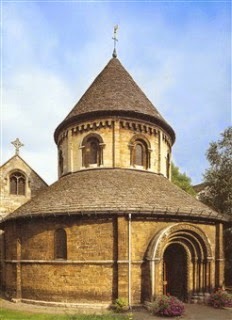 I began at university, in the Round Church at Cambridge. Below the Church, like a secret in the basement, was a little pottery, kiln included, for any student who wanted to come and throw a pot or two. There were no teachers, nobody to tell you a thing. At that time there was no Youtube either, to learn from a vast world of potters out there. You were given a key to enter the ancient grotto -- any time of night or day -- and then, mostly in solitude, you stared at the wheel that was spinning, and tried to figure it out. I have a pot I made then, and wonder how I made it at all. My first real teacher, Bani de Roy, was a student of the illustrious Shoji Hamada, and she had a studio in Gulmohur Park in Delhi. She was an austere disciplinarian of the old school who believed in practise. And practise, practise, practise. For two months -- or however long it took to get it perfect -- she compelled her students to make nothing but cylinders. You were fired up by visions of gorgeously glazed teapots, bowls and urns; but if she glimpsed you trying out anything but a cylinder, that hot Delhi barsaati turned instantly Arctic. 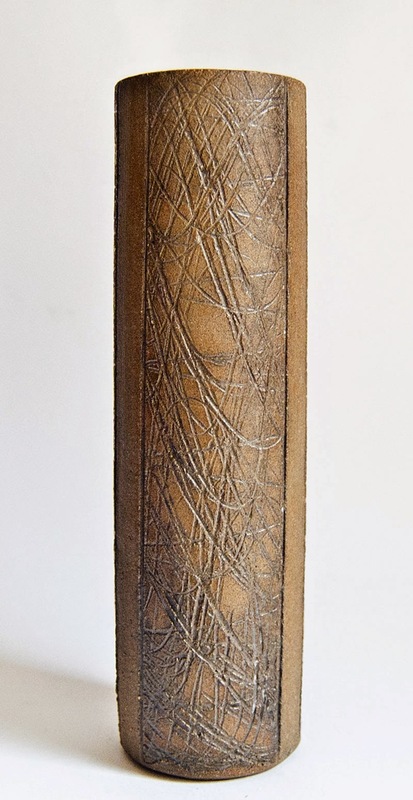 What is a cylinder, speaking ceramically? It is the most basic shape, a straight-sided tumbler of sorts. Once made, you can billow it out into a bowl or close it up into an urn, or rim it for a lid, go with it wherever your imagination takes you and however far your control of the clay lets you go. But first you have to get that cylinder right. You prepared your clay (that’s another story), weighed out balls of 500 grams each and then you sweated blood and tears over the wheel. For days you couldn’t centre the clay. Or you could not pull up the walls. If you did pull the walls up to your disbelieving satisfaction, you managed to warp the rim or poke a finger through it just as the damn thing was getting to a magical 5 inches. Or the walls were of uneven thickness. Or there was an airbubble trapped in the clay that popped out as an angry blister as the walls thinned. Or you made it right but cut it off the wheel badly. Or you had made the base too thin (or too thick). In each case, you had to plop your painstakingly-prepared clay into the slop bucket, and go back to the beginning. At first if you managed to create an object that looked somewhat like a cylinder, you beamed, looked around for appreciation. Bani-di (that is what we called her) frowned and thought about it, then said: Throw it away and start again. She was about seventy then, white-hair in a small bun, tall and already creaky, with spectacles that the light bounced off. If it involved work, she smiled very little in the first few months and when she did, you went home walking on air. After telling you to throw whatever it was away, she went back to reading her newspaper, or to the giant pot she was throwing effortlessly on another wheel even as you slumped and listened to the sound of your heart shattering. And this of course, is why making pots and writing books feel so much alike. You throw it away and start again. And again. Your article, 'Writing a Cylinder', rekindled memories of my childhood. My brother and I, after school, would walk home through a settlement of potters and I would often watch with amazement the deftness with which the artisans would craft one earthen cup after another out of a seemingly unending loam of clay. The clay itself was sourced from a riverbed, or a pond, and was carted long distances in an improvised wheel barrow. 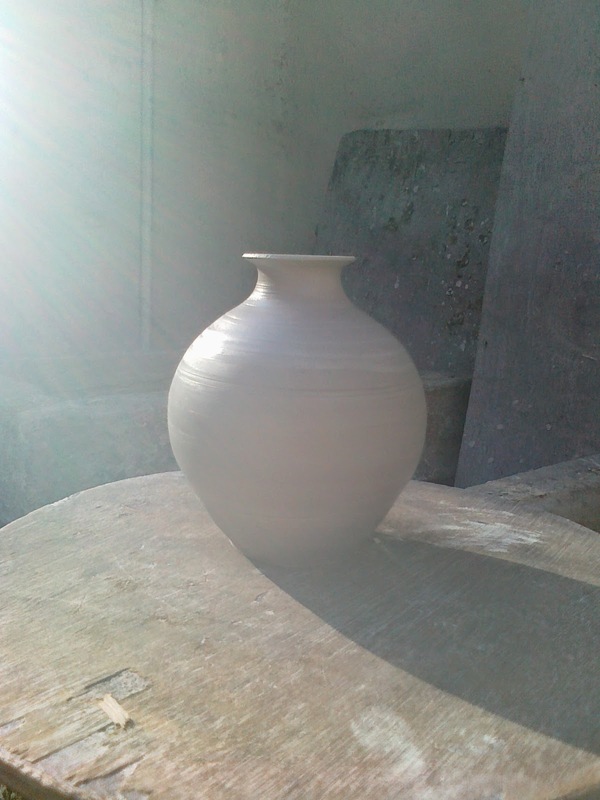 What struck me then about this craft was the relative silence in which the potters worked. Rarely would one find a potter chatting with someone or a radio blaring nearby while he was on the wheel. Now for some trivia gleaned from my rural upbringing. The potters belong to a caste called Konhaar and are distinct from the Kanhaar (the palanquin bearers). Both of these are supposedly lower castes but are not treated as untouchables. In fact, the Kanhaars along with the Nau or barber, play an important part in the so called upper caste marriages and funerals. The Konhaars would also be employed in laying the tiled roofs of rural houses. 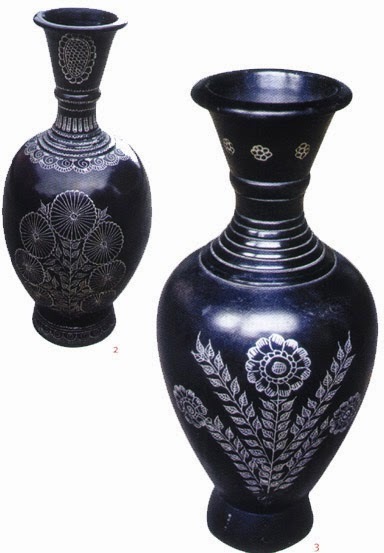 Nizamabad, a small township about 30 km from my hometown Azamgarh, is known for 'black' pottery. The trick, I am told, lies in mixing goat dung with the clay and baking the pieces in a covered clay oven which lends a glossy black sheen. The pottery is thereafter finished with hand etched designs which are filled with a powder mixed with mercury. Please see the attached photo to get an idea of what I have described." Simply and elegantly put...absolutely beautiful! Thank you! Glad it struck a chord. Sounds familiar, doesn't it, Anisha... thank you. Beautiful writing. I shared it on my Facebook for a friend who would love to read this. Thank you for sharing it, Indrani. Are you a potter too?